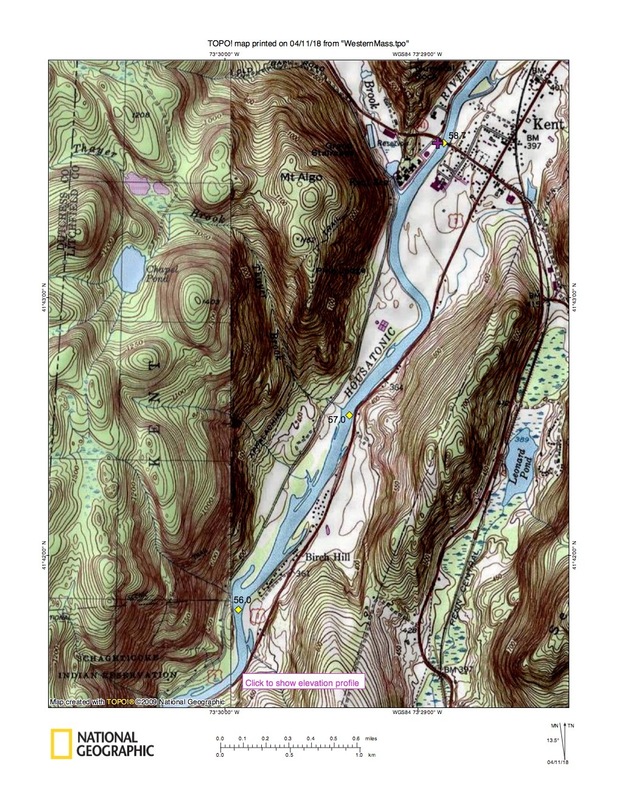 The stretch of four miles of river from the Kent School all the way to Bulls Bridge Take-Out is smooth flat area. It will seem alot like paddling a lake. 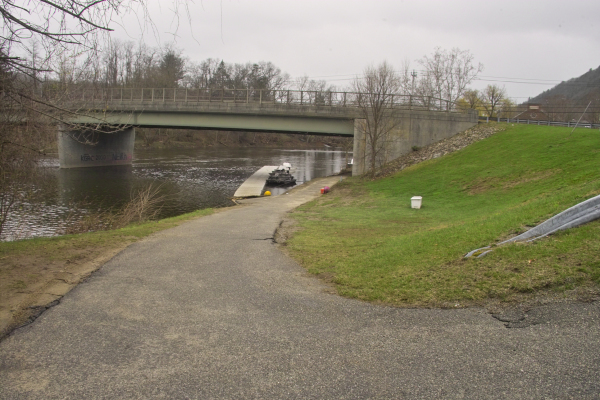 Route 7 follows closely on river left (east shore) for more than half of this section. Enjoy the lazy paddle. There are warnings not to travel further than the north end of the Bulls Bridge Island. It's important to know that there are two dams, one on each side of the island. The take out is at the north end of the island. Travel to the left side of the island and take out a very short distance from the north end. Follow the trail south for 0.4 miles and put in just above the covered bridge. If this is your take out, then continue to the road, cross the covered bridge. The parking area is on your right just before the intersection with Route 7. It is possible to put in below the dam but often the water level is very low because the redirecting of the water for power. Also, there can be difficult Class 2 and Class 3 rapids with numerous rocks and ledge. 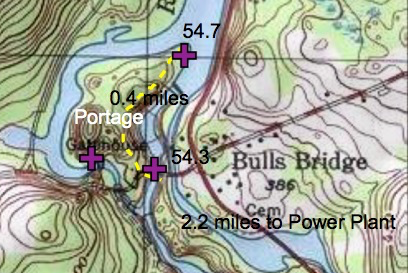 If you do not want to attempt travel through the rocky and difficult area below Bulls Bridge, consider using transport to move your boat(s) from Bulls Bridge to the Candlewood Power Plant Put-In. Do not attempt to take the power canal that leads to Cedar Hill Pond. All this area is No Tresspassing for very good reasons. The level of this pond can change at any time as the water may drop into the power plant. Take out at the north end of the island. 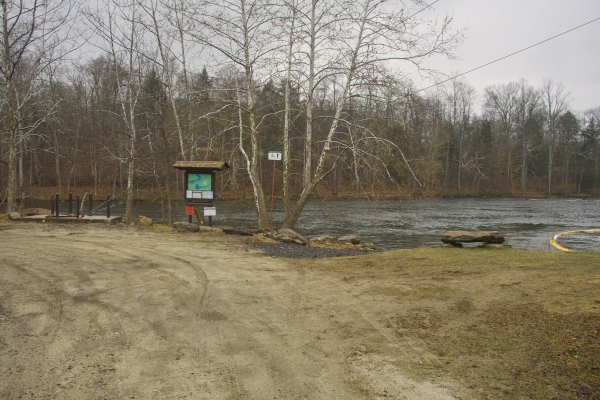 Follow the trail for 0.4 mile close to the covered bridge. From the center of Kent Ct at the intersection of Route 7 and Route 341. At the stop light, take Route 7 South. At mile 3.9, turn right onto Bulls Bridge Road. Parking is immediately after turning on your left. 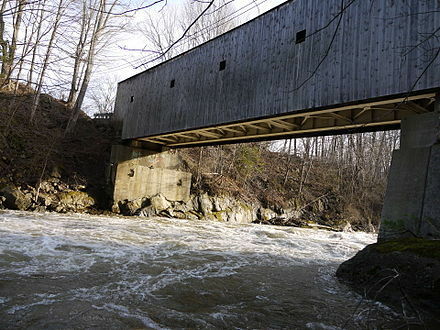 Walk over the covered bridge and take the trail on your right down to the river. A view of Bulls Bridge. Grass car top boat launch. Do not interfere with school activities. Head West on Route 341. 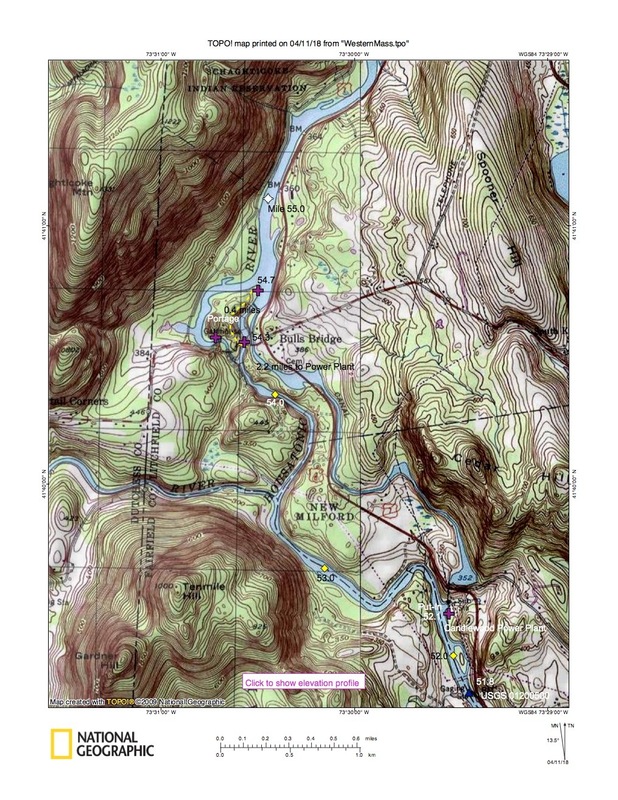 Cross over the Housatonic River. At mile 0.3, turn right onto Skiff Mountain Road. The lauch area is immediately on your right almost under the bridge. 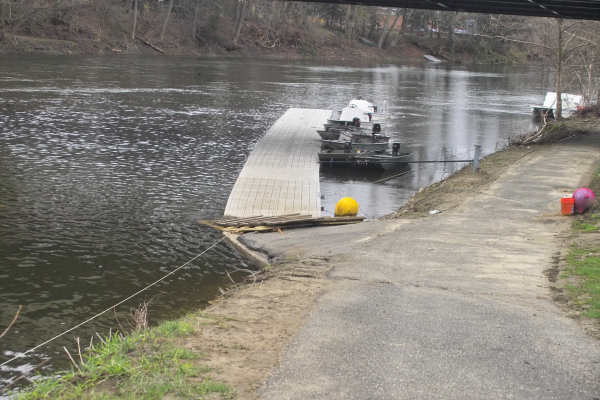 The school launch area has a floating dock. Launch or Take-Out at the shore near the grass. The dock is private. Kent is a leading secondary school with a rich tradition and history since its founding in 1906. The Kent experience — learning, growing, making friends — will change your life. You will be prepared here for the rigors of college and will become increasingly ready to think about your vocation and possible careers. You will share in the joy of being a member of a close-knit community and learn the importance of serving others. The School’s curriculum is at once ancient and modern, as it embraces all the liberal arts, including experiential learning in numerous fields. There is a comfortable balance here between academics and the many other activities that enrich one’s life. The School is also committed to helping you develop a spiritual life. St. Joseph’s Chapel stands at the center of our beautiful campus. 2.2 Mile from Bulls Run Parking Lot to Power Plant. From the intersection of Bulls Bridge Road and Route 7 in Kent. At mile 1.5, pass a tall light yellow building on your left. 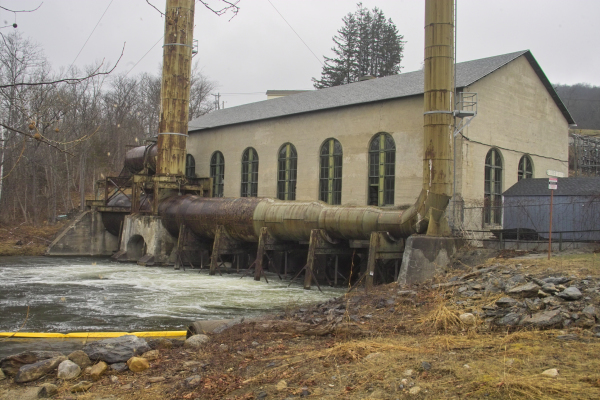 At mile 1.6, across from Grove Road, turn right down the paved driveway for the Power Plant. Launch or Take-Out just down river of the plant. Gravel parking area for car top launching.